DBH Dance Party: when is a fluke not really a fluke? I do have some thoughts on the (apparently inevitable) addition of Texas A&M as the Southeastern Conference's 13th member, even one really crazy idea of how to reinvent the SEC schedule by dumping division play entirely. But that can wait. Right now I want to talk about Gene Chizik. When something happens once, and then that same thing continues happening over and over again, it's hard to believe that thing is a coincidence. This is true of life and of college football. Certain things keep happening over and over again and it's hard to believe they won't keep happening. This is why, for example, Alabama had to fire Mike Shula after 2006: it became obvious to anyone who had watched his teams those four seasons that the program was what it was and wasn't going to be anything different (John Madden would appreciate that sentence). It's also why Georgia is most likely going to say goodbye to Mark Richt when the season is over — there's no "getting better" for the program at this point. What you see is what you get. And I guess the reason I'm bringing this is up is this: I don't think Gene Chizik is a very good defensive coach. Believe me, I'm not overreacting to what happened Saturday vs. Utah State. There were multiple reasons for that — Auburn is a young defensive team, it was an early kickoff, Utah State is probably better than anyone realized, and so forth. Just hear me out on this: As of this week, Gene Chizik's Auburn is averaging giving up 374 yards per game, and right around 5.3 yards per play. By contrast, the final two Auburn teams of the Tommy Tuberville tenure — including the putrid 5-6 team that ushered in Tuberville's ouster — surrendered just over 307 yards per game, and 4.7 yards per play. It goes beyond that, though. As an Alabama fan, I've been watching a Nick Saban-coached defense since 2007 now, and I can tell you with some assurance that Saban's Alabama teams are rarely out of position and do not miss tackles. These things were true even during Saban's first season, when his best defensive lineman was Wallace Gilberry. That 2007 defense was pretty sieve-like, actually, giving up 345 yards per game and 5 yards per play and yielding over 400 yards of offense three times, to Arkansas, Houston and LSU. The following season: 263.5 yards per game, 4.3 yards per play and zero 400-yard games. It makes sense that the defense would get better in Year 2 under a head coach: The coach has a full offseason to implement his schemes, he's been able to recruit more of his type at various positions, he's more used to the teams on his schedule, so he knows what works and what doesn't. Teams should generally improve in Year 2 for a new head coach. Auburn's defense in Year 2 under Gene Chizik got worse. Now here's where it gets weird: Chizik is a career defensive assistant, someone who even won the Frank Broyles Award as the nation's top assistant coach at Auburn in 2004. This is where the "Ted Roof is a bad DC" argument breaks down; it seems as though Chizik, like Saban, would be the guy ultimately in charge of the defense, and thus ultimately responsible for its performance. In fact, Chizik's boss at Auburn, Tommy Tuberville, was always culpable for the performance of the defense at Auburn; at Media Days in 2005, after Chizik was gone and David Gibbs had taken over, Tuberville stated flatly that the AU defense would be pretty much the same. "We run MY system," he said. And it is true: during Tuberville's tenure, Auburn's defensive ranking never really fluctuated much up or down, regardless of who was the official "defensive coordinator." Just for the heck of it, I looked up the stats for Chizik's teams at Iowa State: in 2007, the 3-9 Cyclones gave up 390 yards per game (not great, but respectable) and an incredible 5.8 yards per play (almost exactly his team's numbers at Auburn thus far). In Year 2 — again, the year where you'd expect them to make a leap forward — Iowa State (2-10) surrendered 451 yards per game (schnikes) and an incredible 6.7 yards per play. In the Big XII North, in which they played neither Texas nor Oklahoma. "But wait," you (and I) say. "This doesn't make sense. Hasn't Chiz been part of two national championship teams (and one that probably should've won one)? Isn't the whole point of coaching to win games?" And the answer is yes, of course it is. But as long as we're being perfectly candid, we should note that those two national championship teams — 2005 Texas and 2010 Auburn — were offensive scoring machines. The '05 Longhorns — led by transcendent quarterback Vince Young — failed to score 40 points only once all season (in a comeback win over Ohio State). In fact, that Texas team scored 50 points three times that year, 60 points three times that year and even broke 70 vs. Colorado in the conference title game. 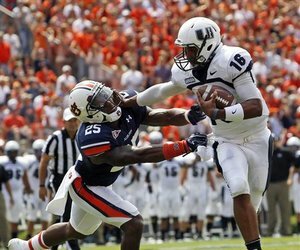 If you think that sounds familiar, that's because the '10 Auburn squad was almost that good: led by Cam Newton (an undeniable force of nature), the Tigers rang up 50 points six times (not counting the 49-point effort vs. Georgia) and hung 65 on Arkansas (Auburn gave up 43 points that day and still won by the three touchdowns). Now, here's where I have to give credit where it's due: Chizik's defenses, for all their statistical woes, do seem to rise to the occasion when it matters. In the aforementioned 2005 Rose Bowl national championship, it was the Texas defense that stoned USC on a fourth-down try near midfield to give its offense a chance to win the game (and then stopped them again on the final drive). And we've documented previously in this space what Auburn's defense did at key intervals during last year's run. Nevertheless, it's no longer a shock to see Gene Chizik's teams playing poorly on defense. Apparently that's just the way it is.